Ali Daei (pictured in 2018) is the only male player to score over 100 goals in international football with 109 goals. Indicates the FIFA world top scorer. Indicates the top scorer of the respective confederation. Indicates the top scorer of the respective nation. 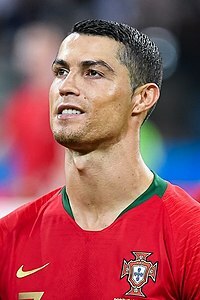 Cristiano Ronaldo (pictured in 2018) is the currently active player with the most goals in international football. He also has the most goals by a European player in international football. Ferenc Puskás held the record of highest number of international goals of 84 for 47 years since his 84th goal in 1956 against Austria till Ali Daei broke it in 2003 after scoring his 85th goal against Lebanon. Updated as of 11 October 2018. Mamrud, Roberto; Stokkermans, Karel (15 March 2017). "Players with 100+ Caps and 30+ International Goals". Rec.Sport.Soccer Statistics Foundation. Retrieved 22 June 2017. ^ "Robbie Keane – Goals in International Matches". Rec.Sport.Soccer Statistics Foundation (RSSSF). Retrieved 15 March 2016. ^ "Sunil Chhetri Statistics". national-football-teams.com. national-football-teams. Retrieved 14 October 2018. ^ "11 Didier DROGBA". FIFA.com. Archived from the original on 17 July 2014. Retrieved 1 March 2016. ^ "Lionel Andrés Messi - Century of International Appearances". www.rsssf.com. Retrieved 8 September 2017.